CPN | My brother can help me get through this. December 22 marks the 18th anniversary of my nephew Hayden’s death, peacefully at home, from complications related to infantile Tay-Sachs. My daughter, Cameron, who also had infantile Tay-Sachs, died 5 months later, also peacefully at home. And this really marks the beginning – the seed for what would become Courageous Parents Network 14 years later. Hayden and Cameron were diagnosed within two weeks of each other. Thereafter the four parents—Tim and Alison, Charlie and I—processed and coped together. We traveled the path alongside each other and that made all the difference. As identical twins, Charlie and Tim had always been close but this was something else entirely. Charlie came to Tim when Hayden was diagnosed. And then Tim came to Charlie when Cameron was diagnosed. Charlie came to Tim as Hayden was dying, and Tim came to Charlie as Cameron was dying. Hayden was a year older than Cameron, a year further along the disease progression, so while we were traveling together, Tim and Alison and Hayden were really leading the way. Hayden’s death represents the utter distillation of that—Hayden, Tim and Alison giving us visibility to the scariest thing that lay ahead for us. Tim and Alison’s courage was an utter inspiration to me. Even today, I tear up just thinking about it. And then Charlie being there as Hayden was dying, supporting his brother, sitting with Hayden, and learning from all of it what end of life could look like and what people were capable of gave Charlie and me the faith and confidence that we could do it too. Tim and Charlie’s story is exceptional in its uniqueness but the themes it evokes are available to all of us. 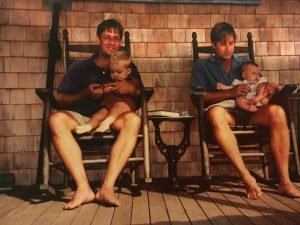 For the first time since the children’s deaths, Tim and Charlie sat down together this Thanksgiving to share on camera what that experience was like for them. In honor of Thomas Hayden Lord, as beautiful and brave and sweet a little boy that ever lived, who taught his uncle Charlie so so much during those last few days, and in honor of the two brothers who became fathers who helped each other do the impossible, we share this excerpt from their conversation.